E.G.O produce a variety of limit thermostats in various shapes, sizes and materials so that they can supply exactly the right single pole limit thermostat (or. Thermal Cut Out - TCO) for every appliance. The single pole limit thermostat can be supplied with many different capillary tube lengths, which makes them extremely flexible to install. The single will detect the temperature of the medium, while the housing can be positioned in the most suitable location. E.G.O single pole limit thermostats are manufactured using high quality stainless steel tube and are suitable for high ambient temperatures. 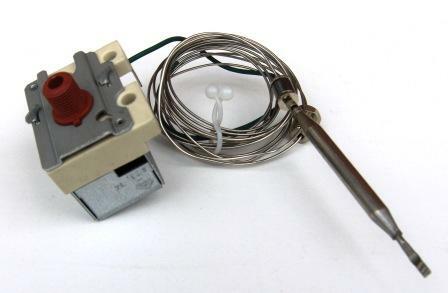 Above is a typical E.G.O Limit Thermostat, with a manual reset button - Type: 55.135series. Above is a typical E.G.O Limit Thermostat, with a manual reset button - Type: 56.105series. The Type: 56.105series is the latest and most effective single pole limit thermostat E.G.O have produced. This model has trip free security, which prevents tampering of the manual reset button and also has a pressure sensitive fail safe system, which breaks the electrical circuit if the capillary is accidentally damaged. 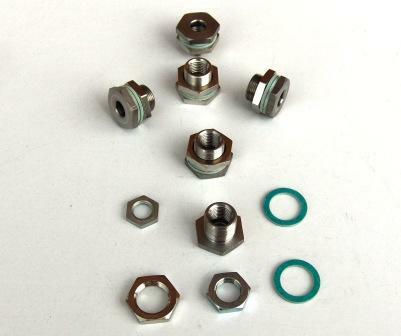 E.G.O Accessories for Limit thermostats. A temperature sensor consists of a sensor, capillary tube (0.5mm I/D), diaphragm and filler medium. The filling medium heats up in the sensor and expands, thus increasing pressure in the closed system. When the pressure achieves a defined level, the diaphragm actuates the snap-action switch that either opens or closes the electrical circuit. The single pole limit thermostat (TCO) have a very short working stroke. A distance of 0.01mm at the diaphragm corresponds to a temperature change of approximately 3 Kelvin in the oven, for example. This requires extremely high precision production.